emolument: Payment for an office or employment; compensation. It seems that the flow of money from foreign government payments into the Trump Organization will often test that law. According to Richard Painter, a University of Minnesota law professor who had served as chief ethics counsel to President George W. Bush, any such payments “in excess of fair market value” would be judged a gift — and a violation of the Emoluments Clause. There’s almost no way to imagine that this won’t happen under the current arrangement. Trump’s wide-ranging business will involve thousands of interactions across multiple countries, and in countries whose foreign governments’ will have clear incentives to curry favor with the president. We’d have to believe that not a single one of them will ever do something that disproportionately helps Trump’s private business — an idea which doesn’t pass the laugh test. [I]f he’s going to hold onto these business enterprises, … to satisfy the Constitution, at a bare minimum, what he’s going to have to do is get the foreign government money and money from foreign government-controlled corporations out of his business enterprise. And this includes foreign diplomats staying at the hotels at government expense, foreign governments having big parties in his hotels and canceling reservations at the Four Seasons, going over to the Trump Hotel, to curry favor. All of that is unconstitutional. Also, he has bank loans outstanding, I believe, from the Bank of China, which is controlled by the government of China. And some foreign government-owned banks are leasing space in Trump office buildings. All that has to be dealt with before January 20, or we could have a violation of the Constitution. [W]hatever price was paid would be subject to criticism and scrutiny. Was it too high, is there pay for play, was it too much pay to curry favor with the president-elect. And selling his assets without the rights to the brand would greatly diminish the value of the assets and create a fire sale. President-elect Trump should not be expected to destroy the company he built. … [S]elling the entire Trump Organization isn’t even feasible. The approach that he is taking allows Don and Eric to preserve this great company and its iconic assets. I appreciate that divestiture can be costly. But the President-elect would not be alone in making that sacrifice. I’ve been involved in just about every Presidential nomination in the past 10 years. I also have been involved in the ethics review of Presidents, Vice Presidents, and most top White House officials. I’ve seen the sacrifices that these individuals have had to make. It’s important to understand that the President is now entering the world of public service. He’s going to be asking his own appointees to make sacrifices. He’s going to be asking our men and women in uniform to risk their lives in conflicts around the world. So, no, I don’t think divestiture is too high a price to pay to be the President of the United States of America. With Trump’s willingness to ignore protocol and the Constitution, along with his disregard for facts and common human civility, we can expect more impeachable offenses from him. 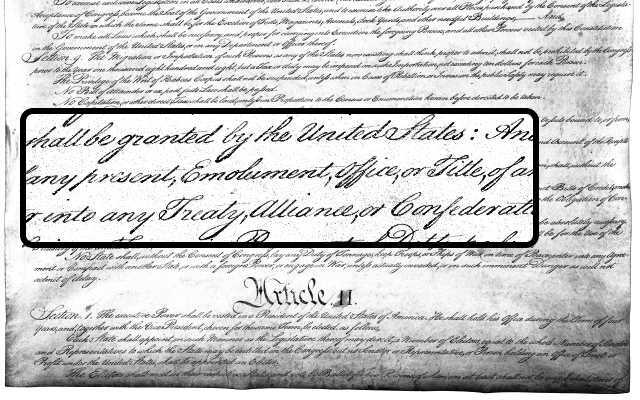 But for now, it looks like violation of the Emoluments Clause stands to be article one. At a rally, Raskin said that he may well be voting to impeach Trump in a year or two. It was just an aside comment, but it drew a long bout of cheers from the crowd. I’ve heard Richard Painter, ethics advisor for Bush administration, and Norm Painter, ethics advisor for Obama administration, discuss this. Trump putting his assets in a blind trust while he’s president made the most sense. Playing it fast and loose and discrediting anyone who questions him is Trump’s historic m.o. So sad that The Paragraph is part of the “dishonest media” !?!? Trump cannot label us — Bush II already has. We are the REALITY-BASED COMMUNITY!